Together with cooperation partners from the U.S., the researchers surrounding Prof. Dr. Martina Havenith (Physical Chemistry II of the RUB) describe their discovery in a so-termed Rapid Communication in the prestigious American chemistry journal, the Journal of the American Chemical Society (JACS). Temperatures of minus 1.8 ° C should really be enough to freeze any fish: the freezing point of fish blood is about minus 0.9 ° C. How Antarctic fish are able to keep moving at these temperatures has interested researchers for a long time. As long as 50 years ago, special frost protection proteins were found in the blood of these fish. These so-called anti-freeze proteins work better than any household antifreeze. How they work, however, was still unclear. The Bochum researchers used a special technique, terahertz spectroscopy, to unravel the underlying mechanism. With the aid of terahertz radiation, the collective motion of water molecules and proteins can be recorded. Thus, the working group has already been able to show that water molecules, which usually perform a permanent dance in liquid water, and constantly enter new bonds, dance a more ordered dance in the presence of proteins – "the disco dance becomes a minuet" says Prof. Havenith. 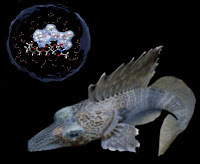 The subject of the current investigations was the anti-freeze glycoproteins of the Antarctic toothfish Dissostichus mawsoni, which one of the American partners, Arthur L. Devries, had fished himself on an Antarctic expedition. "We could see that the protein has an especially long-range effect on the water molecules around it. We speak of an extended dynamical hydration shell", says co-author Konrad Meister. "This effect, which prevents ice crystallization, is even more pronounced at low temperatures than at room temperature", adds Prof. Havenith. Nevertheless, to freeze the water, lower temperatures would be necessary. Complexation of the AFP by borate strongly reduces the antifreeze activity. In this case, the researchers also found no change in the terahertz dance. The researchers' results provide evidence for a new model of how AFGPs prevent water from freezing: Antifreeze activity is not achieved by a single molecular binding between the protein and the water, but instead AFP perturbs the aqueous solvent over long distances. The investigation demonstrated for the first time a direct link between the function of a protein and its signature in the terahertz range. The studies were funded by the Volkswagen Foundation.